Friday the 13th Part 2 remains one of the best in the longrunning F13 slasher series, a perfect companion to the original, and one of the better horror sequels. Directed by Steve Miner, it stars our favorite F13 heroine, Amy Steel. Tom Savini passed on the project so the special make-up effects were created by Carl Fullerton. If anything, Friday the 13th Part 2 holds a special place for genre fans because who can resist seeing Jason Voorhees stalk and kill his victims before he donned a hockey mask? Alice (Adrienne King) is having nightmares after having recently dispatched that nasty Mrs. Voorhees. Alice remembers the night she found all of her friends murdered - how she stumbled into the older woman and discovered who was behind the bloody massacre at Camp Crystal Lake. So began a deadly cat and mouse chase...culminating Alice picking up Mrs. Voorhees' machete and decapitating the murderess. She recalls a dream (or was it reality?) that she was resting the next morning on a boat in the lake...and the dead woman's disfigured son Jason yanked her down into the water. Alice was told in the hospital that there was no trace of the boy. Alice wakes up and the phone rings. It's her mother calling to check up on her. She reassures her mom that she's okay and then goes into the shower. Something makes her nervous and she cuts her shower short. The phone rings again but there's no one there. Alice sees that one of the windows is open and picks up a knife. She walks towards it and a stray cat jumps in. Frightened at first, she asks the animal if it wants something to eat. Alice opens the refrigerator and finds the head of Mrs. Voorhees. She screams...and is grabbed from behind by an intruder who sticks an icepick into her temple. Young people are arriving at a counselor training center near Crystal Lake. Jeff (Bill Randolph) and Sandra (Marta Kober) stop at a gas station to call their friend Ted for directions. Crazy Ralph (Walt Gorney) is at it again - and tells them that they're doomed. At the counseling center, the lead trainer Paul (John Furey) explains to the assembled bunch what they have to look forward to. The group includes Mark (Tom McBride), who's confined to a wheelchair - and Vicky (Lauren-Marie Taylor), a girl who has a crush on him. Paul's girlfriend Ginny (Amy Steel) arrives late...much to his annoyance. That first night, the counselors are sitting around a campfire. Paul tells them the story about "Camp Blood" and how Jason saw his mother killed and sought revenge. He describes how the boy (now a grown man) murdered Alice and that her body was never found. Jason is still out there, Paul tells the group. Just then, Ted jumps out of the darkness and nearly scares everyone to death. Paul says it was simply to show that everything is fine and there's "nothing out there" - and reminds them that Camp Crystal Lake is off limits. Shortly after, everyone is relaxing in the main cabin. Scott (Russell Todd) is flirting with Terry (Kirsten Baker), while Sandra tells Jeff that there must be some truth to the legend...and that she wants to see Camp Blood. Ginny goes to her own cabin and finds Paul there. As they're making out, Crazy Ralph is watching them. Suddenly, someone in the tree above puts a wire around the old man's neck and strangles him, drawing blood. During their training the following day, Ginny senses a stranger lurking about. Muffin the pooch runs right into the figure. Sandra is still curious and insists on going to the other camp. She and Jeff wander off and find a slaughtered animal they believe to be a dog. They're stopped in their tracks by Deputy Winslow (Jack Marks) who takes them back to Paul. As he's driving away, the officer catches a glimpse of someone running into the woods. He gets out of his car and chases the figure into an abandoned shack. Deputy Winslow searches the place...and Jason (Warrington Gillette) comes up from behind and strikes him with the claw end of a hammer. Later, most of the counselors go into town for a night of drinking. Jeff, Sandra, Terry, Scott, Vicky and Mark stay behind. It's a full moon and Terry decides to go skinny dipping in the lake. When she emerges, she notices that Scott has taken her clothing. He gives most of them back to her...and as Terry tries to get her skimpy t-shirt back, Scott steps into a trap. He finds himself strung up on a tree by his ankles. Terry goes back to her room to get a knife to cut the rope. Scott sees Jason approach him with a machete and his throat is cut. Terry returns and finds Scott dead. As she tries to get away, she runs right into the killer. At the bar, child psychology major Ginny wonders about the Jason legend...and imagines what he would be like today. He could be "some kind of out of control psychopath, a frightened retard, or a child trapped in a man's body," she says. Paul and Ted are amused. Meanwhile, the hormones of the two couples at the camp are raging. Vicky comes on strong to Mark and goes to her room to change. While Mark waits for her on the porch, Jason strikes him in the face with the machete and sends the poor guy down a flight of stairs. Jeff and Sandra are in an upstairs room. Jason enters the cabin and finds them. While Jeff is on top of her, Sandra looks up in time to see Jason plunge a spear through the both of them. Vicky returns to the cabin and enters their room. It appears her friends are in the bed under the cover and she approaches them. Jason sits up and cuts her leg, before stabbing her to death. Ginny and Paul decide to leave the bar early. They see Jeff and Sandra's bed covered with blood. The lights go out and the two head back downstairs. Ginny is sure there is someone in the room with them and sure enough, Jason leaps out at Paul. The men struggle and Jason gets the upper hand. He goes after Ginny, who runs and hides in the kitchen. Jason breaks through the door with a pitchfork. And Crazy Ralph's body falls out of a closet. The feisty Ginny jumps out of the window and makes it to her car. Of course, the engine doesn't start. Inside a cabin, she crawls under the bed. A rat comes right up to her and she mangages to hold her in her scream. But she can't seem to hold something else and...wets the floor. When she gets out from under the bed, Jason strikes at her but misses. Ginny fights back...first with a chainsaw and then with a chair. She finds the old shack in the woods, unaware that it's Jason's home. She sees Mrs. Vorhees' decaying head on a table and thinking fast, she puts the woman's old sweater on. As Jason approaches, she pretends to be his mother. She tells him that he did good and to kneel before her. As she is about to hit him with the machete, Jason glimpses the head behind her and the ruse is over. He cuts her leg with a pickax and as he's about to strike again, Paul appears. The two men go at it again. Ginny picks up the machete and hits Jason in his neck, finally bringing him down. Ginny and Paul go back to their room. They hear a noise outside. Paul goes towards the door slowly, while Ginny nervously holds a pitchfork. Paul opens the door and they see that it's only Muffin. Friday the 13th Part 2 is a more than worthy follow-up to the original. In the tradition of the "body count" fever of Mario Bava's Bay of Blood, this has all the prerequisite murder sequences...and then some! But it has something else, something modern in the way of Amy Steel - by far the best horror heroine to date. 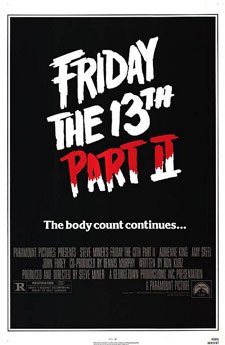 Director Steve Miner would direct the second sequel the next year, Friday the 13th Part III, originally released in 3D. Jason Voorhees donned his hockey mask for that one - and the rest was history.